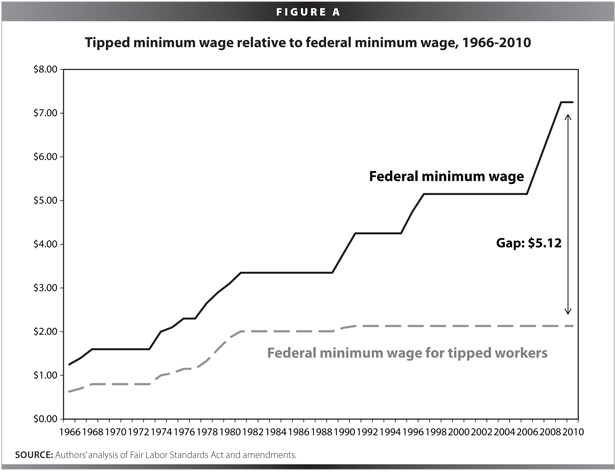 The “tip credit” or “subminimum wage” system basically leaves it up to the consumer to provide the bulk of workers’ earnings. So the customer is always right in determining the worth of a worker’s labor. The person who serves you lunch today may work for a minimum hourly wage that’s less than the price of your coffee. And no matter how generous your tip, at the end of the day, she'll take home much less in wages than what she deserves. Federal law has been exploiting workers like her for years, according to labor advocates, thanks to an ultra-low wage floor that systematically cheats servers, bartenders, hairdressers and others of a fair day’s pay. The minimum wage for tipped workers—known as the “tip credit” or “subminimum wage” system—is just $2.13 an hour, less than a third of the regular federal minimum of $7.25. This rate is based on the assumption that combined earnings including tips will ultimately make up the difference, so total pay will approximate that of other low-wage laborers. Now, as campaigns to raise state and federal minimum wages mushroom nationwide—and with campaigns under way for a $15 per hour wage in fast food joints—the base pay of their fellow workers in diners and cafes seems even more outrageous. 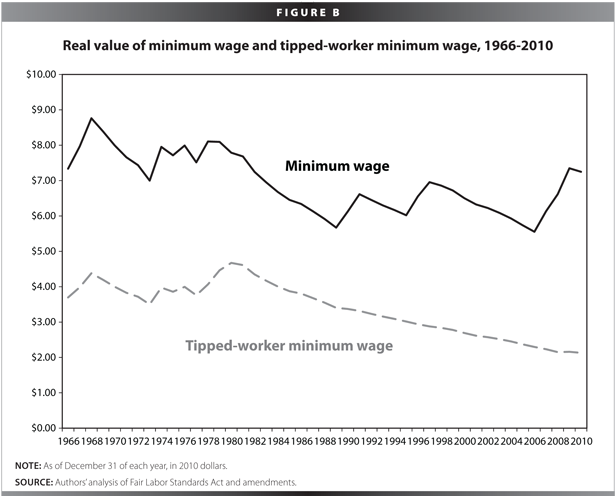 A unique economic relic, the base wage for tipped workers has eroded steadily since 1996, when it was unpegged from the already absurdly low federal minimum. The crumbling value of both wage tiers over the past decade, according to the calculation of advocacy group Restaurant Opportunities Center (ROC), amounts to a yawning gap between tipped workers’ earnings today and what they would have made had the wage rates been adjusted equitably. All in all, the gap represents a net “loss” of more than $20 billion. That loss is spread across a workforce of some six million nationwide. The subminimum applies to various tipped service sectors (based essentially on custom), ranging from bussers to massage therapists to nail salon technicians—generally some of the lowest paid, most precarious jobs. Most are in the restaurant industry, working as bartenders and servers. On top of the poverty wages, tipped workers scrape by on part-time shifts that vary by season, often without benefits or a single paid sick day. Their workplaces are also fraught with lax labor, poor safety regulation and massive wage theft by exploitative bosses. The law basically leaves it up to the consumer to provide the bulk of workers’ earnings. So the customer is always right in determining the worth of a worker’s labor—whether it’s the guy who gropes her as she refills his glass, or the grumpy patron who sends the steak back twice and storms out before the check arrives. But thanks to fierce campaigning and worker organizing by groups like ROC, tipped workers have won some incremental victories. New Jersey, which just passed a general minimum wage hike, is considering a proposed raise in the tip credit wage from $2.13 to $5.93 per hour by 2015. The White House has recommended a similar raise along with a broader proposal to boost the regular federal minimum to $10.10. Parallel legislation has been introduced in the Senate to raise the subminimum to 70 percent of the full minimum. Providing tipped service workers a reasonable base wage is a matter of gender and racial equality and basic dignity. 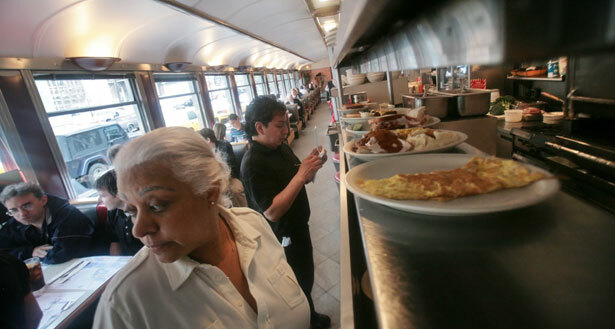 About 40 percent of tipped workers are people of color, and about two-thirds are women. About 30 percent are parents, many of them single moms. States have applied a patchwork of fixes to help plug the wage gap. Seven states, including Oregon and Nevada, have one state wage floor for all workers, tipped and non-tipped; most of these base wages are higher than the federal minimum. Another 26 states have set a tipped minimum wage above the federal level but lower than the state’s regular minimum wage. The powerful industry lobby, National Restaurant Association, claims that paying tipped workers more would hurt the industry and impede employment. Spokesperson Christin Fernandez told FoxNews.com, “This could significantly limit the entry-level opportunities businesses can provide, and as a result, hurt those without the skills or experience and looking to enter the workforce." However, that argument doesn't square with the experiences of states without a subminimum wage: They have significantly lower poverty rates, and the link is particularly stark for workers of color. If tipped workers earned enough to cover these basic expenses, she adds, “It would boost the morale, I think turnover rates wouldn't be so high [and] customer service would be improved." And that would feed into better economic prospects for everyone. According to ROC, if Washington brought the hourly wage floor for tipped and non-tipped workers to $10.10, the extra wages in tips would pump a $12.7 billion stimulus into the economy.